Happy Cinco de Mayo everyone. I had thought about a Mexican beer for tonight but there wasn’t one that took my fancy – maybe on a warmer day but after today’s chilly winds I was set for more of a wooly jumper style of beer and who knows warming cozy ale better than the Scots? Also, I am still fairly cross about a comment I re-read today flicking through the Spring issue of CAMRA’s ‘Beer’ magazine by an idiot. The idiot who calls himself Ade Edmondson went on record saying ‘there is no real beer in Wales or Scotland,’ thus losing any respect and credibility as a beer drinker from my point of view. Ade, meet my friends the Williams Brothers. Based in Alloa (that’s Scotland, Ade), they use traditional ancient recipes to bring us some of the finest and most unusual beers in the whole of the UK and their appeal even reaches overseas. I’ve been a fan of the Williams Brothers for a long time – I especially love their Fraoch Heather ale and have never been disappointed by any of their output. 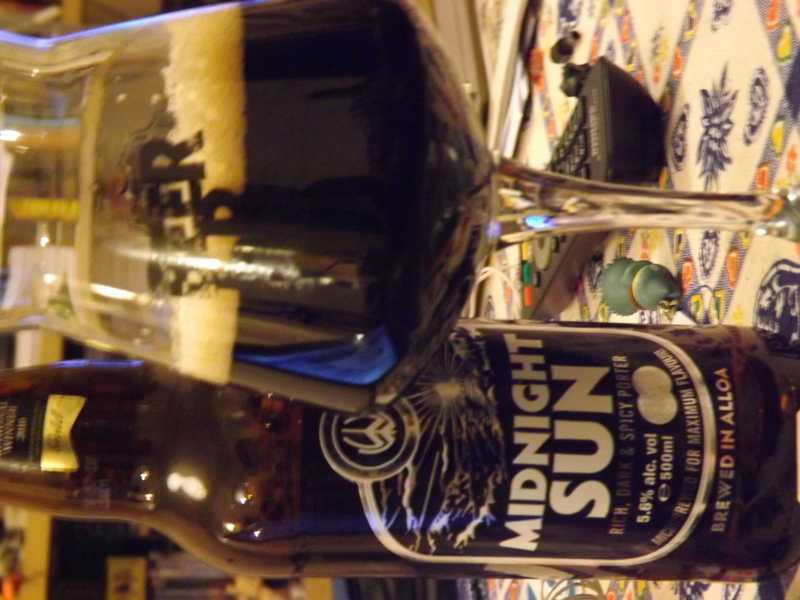 On a recent trip to Bristol, my partner discovered a rather good bottle shop, Corks of Cotham and was thoughtful enough to bring a few beers back for me, including a Williams Brothers Midnight Sun (5.6%ABV). It’s a dark, spiced porter with a little ginger thrown in. It pours out the colour of midnight with a thick, frothy head and you get a generous waft of coffee and spices. The taste is stronger than the 5.6%ABV would prepare you for. There’s a warming richness like a toasty fireside on a blustery night and a thick, almost sticky texture. The initial flavours of coffee and the dark chocolate malts give way to cloves and ginger which continue to flitter around on the tongue, keeping it warm for another sip. There’s also a long bitterness at the end from the hops. Another win for the Williams Brothers then.